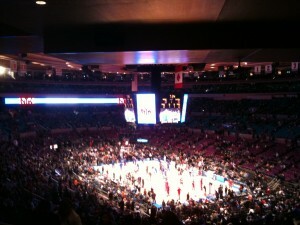 Last night, the New York Knicks lost their home opener to the Portland Trail Blazers 100-95. The Knicks held a nine point lead with 5 minutes remaining in the 4th quarter but poor free throw shooting, and a clutch performance by Brandon Roy, ultimately sent fans at the Garden home feeling very disappointed. This view comes from my buddy Dave, who went in on Knicks season tickets with his brother. After a summer where they could not land either Lebron James or Dwyane Wade, Dave, like most Knicks fans, has been forced to talk himself into the Amare Stoudemire era. The NBA season may be less than a week old but it is still not a good sign when Dave tells me that the two Knicks players who impressed him the most in person where Ronny Turiaf and Landry Fields. One things for sure, if Danilo Gallinari doesn’t start contributing, NY is going to have a much harder time convincing the Denver Nuggets to trade Carmelo Anthony. Fields/Turiaf for Anthony just isn’t going to get it done. Will the Knicks puzzle their fans once again this year? Will Raymond Felton and Amare learn how to run the pick and roll effectively? Will Carmelo successfully force a trade to NY? Share your views.